The Winter Blues Collection is very beautiful with soft icy colors with some gold touches! You can really make beautiful winter pages with this Collection. For this page: I started by making the photo a bit sharper. Then I gave it a blue color treatment. I run an action on it from Graphic River Geometric Art. I made some copies of the photo and used some Artistic filters in Photoshop too. I blended them together with the use of a layermask. In a new document I placed the background paper. I placed the artistic photo. I clipped a copy of the photo on a Ripped piece and then set it to another Blendmode. I added all the Artsy Bits and Pieces,( some were used with styles, or set in another Blendmode.) I stamped the numbers and the WA. I placed a snowflake under the photo. I copied it and rotated the second one a little. I colored the WA in with multiple colors. With the Polygonal Lasso Tool I made selections filled with color that I clipped to the text layers. (In the shapes of the underlying layers.) I made a border around the page. I placed some Artsy bits and Pieces over the photo in Color Burn Blendmode to get that kind of diamond color and texture. 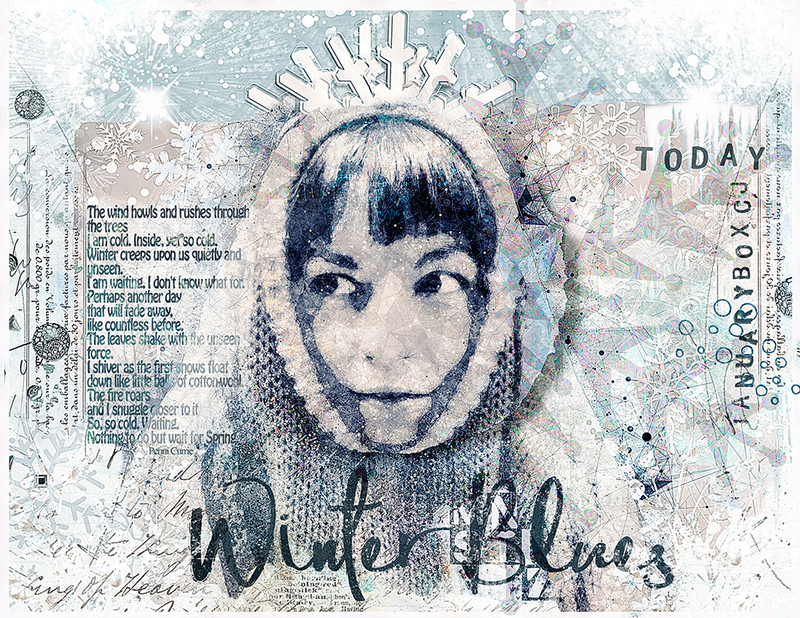 I blended a big snowflake over the whole page and blended parts in with a layermask. I typed the text from the poem. I merged the layers and sharpened and did some Dodge and Burn work.